The cruise ship Rhapsody of the Seas was caught by storm off Greek coast and suffered slight damages of the public areas. The ship was en route from Corfu to Santorini, but west off Peloponnese peninsula was caught by bad weather, heavy rains and strong winds. The vessel entered into an area of low pressure storm, which caused strong winds and increased list. Some public areas suffered slight damages, including twelve of the large Panorama windows in the Viking Crown Lounge on Deck 11 and also glass surface of the pool deck. Fortunately there were no injured passengers, as all were requested to stay in their rooms until weather improves. “Rhapsody of the Seas encountered sudden strong winds for a brief period of time”, said the director of global corporate communications for Royal Caribbean Cruise Line, Cynthia Martinez. “The ship sustained some minor damage to public areas, but is safe and fully operational. Weather conditions have improved throughout the day”, added she. Later during the day, the weather improved and cruise ship Rhapsody of the Seas successfully resumed her voyage to Santorini. The vessel was on regularly scheduled 10-night itinerary round trip from Venice to Corfu, Santorini, Athens, Mykonos, Kotor and Zadar. 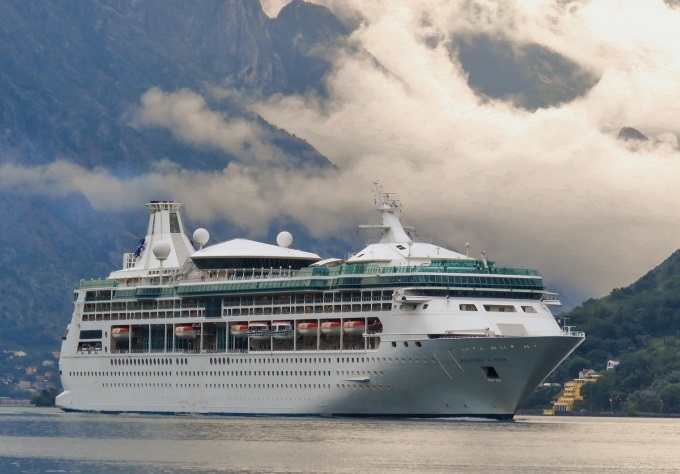 Rhapsody of the Seas is a Vision-class cruise ship operated by Royal Caribbean International. The vessel has overall length of 279.00 m, moulded beam of 32.20 m and maximum draft of 8.00 m. The ship has 12 decks and maximum capacity for 2,435 passengers and 765 crew. 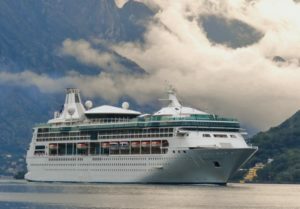 The cruise ship Rhapsody of the Seas has deadweight of 8,439 DWT, gross tonnage of 78,878 GRT and net tonnage of 46,560 NT. So, why did someone I know hear from her brother, who was on the ship, that everyone was transferred off the ship because it was not functional. He had significant bruising to his face. No injuries? I was on the ship during the incident. 44 passengers decided to leave the ship the following day. Everyone else remained on ship. There were definitely people injured and distrought. People were not requested to stay in their rooms, as stated above. Many people were wondering around the ship because it was at least 30minutes after the severe listing of the ship that the captain decided to make an announcement. People were definitely hurt some badly and a lot of terrified passengers. There was water running into deck 5 + 6 stairwells. I was also on the Rhapsody during the Sept 19th incident. In my 10 previous cruises I never experienced an event like this. Yes I have been through storms at sea, but not an event that caused me to slide from the bed to the door in a second or less; an event that I thought if the ship listed any further is good bye…… The next day my wife did speak with a gentleman that was injured, requiring the temporary use of a wheelchair and cane. If there was a request to stay in our rooms, it would have been issued well after the incident. Not reported was the significant amount of water that ran from the 9th floor down the stairwell. Yes the ship was very subdued the next day…..
On the positive side the crew did an awesome job in returning the public areas to normal. Kudos to the dining staff, cooks, retail shop staff, room stewards, bar waiters. etc…. all put in a very long next day. We were on the cruise also and the reports suggested are very different to what happened that morning ! We left Corfu with no reports from the captain that there was no storm ahead just a nice day the following to make up for the poor visit we had in Corfu. We had been travelling for 3 days with thunder and lightening on the coast line but the further south we were travelling it appeared a lot worst . Enjoy the evening and still no reports that suggested what we experienced at just after 5 am , we were woken with a large bump and seconds later a heavy bump buckling our heads up against the headboard with everything tipping onto the floor in cabin m first you think what the hell then when we put on the light we realised that the ship had listed so severe we had to climb with a struggle up hill to our cabin door collecting belongings warm clothes and life vest , made our way to the Antrim and that’s when reality hit home !!! Crew running around like headless chickens looking terrified furniture tipped all over glass smashed and water pooling down the stairwells. Still no report from the captain ! I thought we were going to die ! Lots crying trying to get a signal on their phone to contact children back home m then the announcement!!!!!!! That came from the bridge telling us it was a storm and was under control, trust me looking at the crew they weren’t convinced so neither was we . He them made a further two announcements sounding pre recorded but still everyone was on tender hooks just waiting for the captain to explain exactly what had happened . We have cruised over 20 times and was always under the impression that the passengers safety was paramount, also we should be informed if the weather was going to be bad to prepare yourself and also if it’s rough sail into safer seas … none of that happened the morning of 19th Sep 2016 . We remained on ship until we got back to Venice and in the week never heard nothing about that ordeal from the captain and never saw him in person … very disappointed overall . And as for nobody got hurt , lots got thrown around badly bruised but it’s not the physical damage that got to us it’s the mental . I have had difficulty sleeping , nightmares etc , sweats , panic attacks and with another cruise booked on the sister ship vision in January I’m not sure if I’m able to sail on the sea ever again .